1 November 2014 marks the 70th anniversary of the arrival of 733 Polish children and 105 Polish adults in Pahiatua, Tararua District. A ‘Polish Week’ is being held from 27th of October to 3rd of November with Pahiatua’s Main Street decorated in a Polish theme to welcome the visiting Polish children and their descendants. On 30th October, the ‘Polish Children’ will be welcomed back to Pahiatua by Mayor Roly Ellis at the Town Hall, and tours will be offered, including to the Polish Memorial just south of Pahiatua. Pahiatua residents are asked to join in lining the streets of the town to welcome them back again. For more information on Polish Week, please contact the Pahiatua Information Centre 06 376 6619. So why were the Polish children and adults forced to leave their homeland and travel the enormous distance of 17,730 kilometres to New Zealand? After the outbreak of World War II in 1939 when the German army invaded Poland, their allies the Soviets entered Eastern Poland on September 27 and so began the mass deportation of Polish citizens to the USSR. 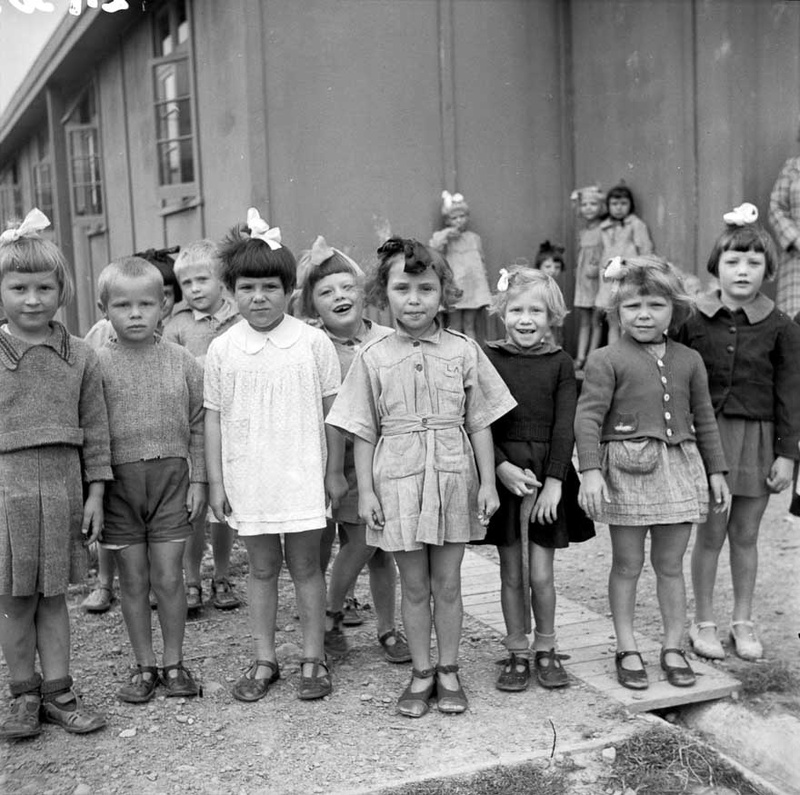 Kindergarten group at a Polish refugee camp, Pahiatua, 7 February 1945. By 1940, cracks were starting to appear in the German-Russian alliance, sparked by disagreements over the division of land captured as spoils of war; as well as conflict over the terms of the USSR’s entry to the Axis Pact. Germany launched Operation Barbarossa and invaded the USSR on 22 June 1941. By this time, more than one and a half million Polish citizens had been deported to Russia. Because of the German attack, Poles who were to be deported to the USSR were granted amnesty, as Poland, USSR, UK, and other allies were now fighting a common enemy. 72,000 Polish soldiers and 44,000 civilians were evacuated to Iran, but when the soldiers left Iran to fight in North Africa and Italy, the civilians were stranded. A call for international help resulted in the New Zealand government inviting a group of orphaned Polish children to New Zealand.On 27 September 1944, 733 children and 105 adults departed Isfahan for Ahwaz in southwest Iran. From here, they crossed to Iraq and boarded a British merchant ship and sailed the length of the Persian Gulf, then crossed the Arabian Sea to Bombay in India, where they boarded an American troopship that was taking 3,000 Australian and New Zealand soldiers home. After only one stop at Melbourne, the ship sailed into Wellington Harbour on 31 October 1944. The Polish refugees travelled by two special trains to Pahiatua Station where thirty-three army trucks transported them to what originally was the Pahiatua Racecourse, but had been converted into the ‘Polish Children’s Camp’. Owing to the decimation of their country, the Polish Government could only offer limited financial assistance, so the New Zealand Government financed the camp, and it was administered by the Ministry of Defence and run by the army.The children were encouraged to assist with cleaning the campgrounds and classrooms; washing dishes; and working in the gardens. All teaching was done in the Polish language, all the street names were in Polish as it was intended that the children would return to Poland. To help the children become acquainted with New Zealand life they and the adults were invited to spend two weeks holiday with New Zealand families. As the children finished the equivalent of Standard 6 in Polish schools, they were sent on to further education or to learn trades. In February 1945, the first group of girls left the camp to go to New Zealand schools. Later another group went to Convent Schools. The last group left on 15 April 1949. When the last Polish Children left, the camp was converted to accommodate ‘Displaced Persons’ who had migrated from camps in Germany. Despite every care taken to keep the Polish people close to their culture in the expectation of repatriation, the Russians insisted on installing a pro-Russian Communist government in Poland and retained the territories occupied in 1939. Britain and the United States agreed to this at Yalta Conference in 1945 and because most of the children and personnel of the Polish Children’s Camp were from Eastern Poland, they could not return home. Tragically, they became stateless people because of these boundary changes. On a happier note, the Polish refugees became naturalised citizens of New Zealand in 1949. The former children of the Polish Children’s Camp felt that they could not allow the only tangible reminder of their happy years at the Camp to disappear. Therefore, the Polish Children’s Memorial Committee was convened in order to build a monument and establish a rest area. The Monument, a white marble monolith, was unveiled on 22 February 1975. This article compiled by Tam Jones from information sourced from J Zawada of the Polish Children’s Jubilee Committee, kindly supplied by Wyn Davidson.